Colin - It's a very strange shaped comet. It's got two parts and early on, it was kind of described as this rubber duck shape with a head and a body. This is still useful to think about because it naturally lets you imagine the shape. The particular thing we're looking at here is on kind of the back of the duck. There are these large pits up to a couple of hundred meters across. These are sort of stretched. They don't look like craters that you find on the moon or on asteroids. They're holes that seem to go into the inside of the comet. Chris - How big is the comet itself? Colin - The comet is about 4 kilometres across. So, the actual solid body of it is pretty small when you consider that comets that we see in the sky actually, they're what we call the coma and the tail, the sort of thin atmosphere stretches over tens of thousands to millions of kilometres. But it all comes from a very small, central, icy body that's only the sort of size of a small town. Chris - Where do comets originate from in the first place? Colin - A comet like this one we think comes from a region of our Solar System called the Kuiper belt which is the area of the Solar System where Pluto is. It's out in the outer observable edge of the system. It makes them very interesting because bodies that have been out there have kind of been in deep freeze since the time that the planets formed. So, what we're looking at is we're looking for a little remnant from the time of formation of the planets, the left over building block if you want. Chris - And how does this comet happen to be coming past us only now, given that it dates from way back 4.5 billion years ago when the Solar System formed? Colin - Comets like Churyumov-Gerasimenko actually are only in the inner Solar System for relatively short time on the age of the Solar System so maybe a few tens of thousands of years. What happens is that somewhere in the outer Solar System around Pluto, a body like this comes close to some larger objects for example. The gravitation effect of one of the larger bodies out there like Pluto slingshots small bodies in towards the inner Solar System and eventually, they come in and then get into these orbits that take them closer to the sun. As they get close to the sun, their ice starts to evaporate away and produce the tails that make them look like a comet as we know them. Chris - Do you think that the same process could also explain these interesting pits? Colin - That was one of the first possible explanations people looked at so all we know, the material comes from a comet. Maybe these are just eroded away and we see that some of the activity of the comet comes from these pits. But the paper shows that if you do calculations, they can't just form by this way because the time that the comet is in the area nearest - in the inner Solar System - isn't long enough to have dug all of these pits. So, the paper goes on to describe, they must have formed by collapse of material into the inside. So the idea is that these are sinkholes, that there are some spaces, a cave or a void, inside the comet itself. Then what the activity does is it kind of weakens the surface enough until one of these collapses in to form these holes. 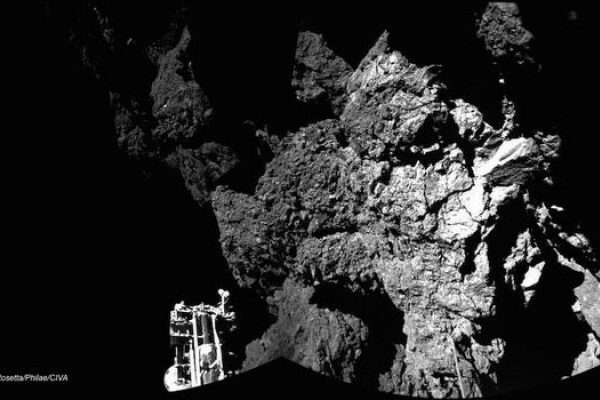 Chris - Do we have a stronger idea yet as to what this comet is made of and even, has anyone tried to weigh it so that we can begin to establish what might be in there or what might not be in there to make these voids for them to be able to tumble into. Colin - We have some ideas about this because Rosetta has been making measurements on the surface and these pits are actually quite interesting because if you look at the walls of the pits, you see what were referred to as these 'goosebumps' or another phrase that was used was 'dinosaur eggs' which are these sort of balls a few meters across that make up the wall of the cliff. So possibly, this pit that's collapsed is allowing you to see that kind of building blocks inside. In terms of weighing the comet, yes, we have been able to do that because we could measure the deflection of the spacecraft when it first arrived, caused by the gravity of the comet. So, we know that its overall density is actually much lower than ice. Chris - So, that would fit with the idea that there may be cavities inside into which material could tumble and make these pits. Colin - Yes. It definitely helps to explain it if we have these cavities inside, sort of like a Swiss cheese type model of the comet. From where do comets get their water? Would a Mars probe in the Sahara desert detect human civilisation?